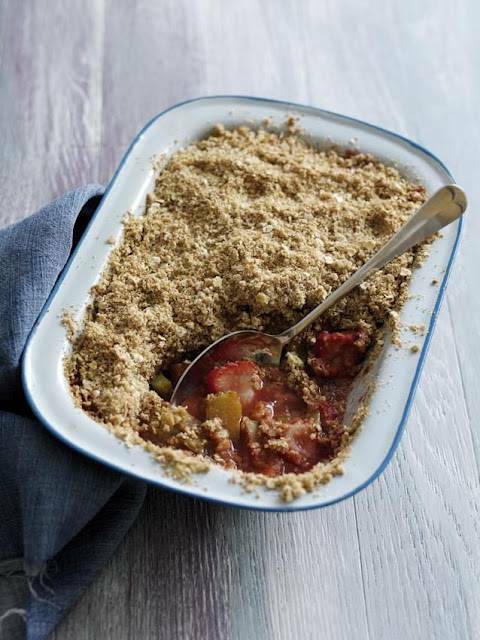 Rhubarb and Strawberry Crumble By Roisin Proulx …. Preheat the oven to 180°C/fan oven 160°C/Gas Mark 4. Mix together the strawberries and rhubarb in a large pie dish and sprinkle with the sugar. Put the flour, cinnamon (if using) and oats into a bowl and mix well. Add the Kerrygold butter and rub in with your fingertips until the mixture resembles fine breadcrumbs. Sprinkle this crumble mixture evenly over the fruit and bake for 30-35 minutes until cooked and golden. Another time, use 500g (1lb 2oz) Bramley apples (peeled, cored and chopped) instead of rhubarb, and reduce the caster sugar to 50g (2oz). Roisin Proulx’s recipe has been taken from the Kerrygold Community Recip-e-book, available for free download now!